On Monday 4th September we were treated to the delightful news that Giant Pandas are no longer considered to be endangered animals, something that even now a couple of days later, is still sinking in with many people around the world. In the latest report by the IUCN (The International Union for Conservation of Nature and Natural Resources) they have found that population numbers of the beautiful Giant Panda bears have risen from 1,596 adults to 1,864 in 2014, which is the result of extensive work by the Chinese government and international organisations to enforce poaching bans and expand the areas of protected forest reserves that are the Giant Pandas natural habitats. Giant Pandas are natively found in the mountainous regions of central and western China where they live peacefully grazing in the bamboo forests. They are one of the most famous and easily identifiable animals in the world and are unique among bears as they do not hibernate; have very small babies at birth (weighing a tiny 100g which is roughly the same as an average sized mouse); and survive on a diet that is almost entirely vegetarian. Since their discovery in 1869 by a French naturalist the Giant Panda has fascinated the western world and become a global symbol for conservation. In 1961 the Giant Panda became the logo and symbol for the World Wildlife Trust (WWF) when the company formed, an act that was inspired by the arrival of a Giant Panda named Chi-Chi at London Zoo in the same year. Since 1980, WWF has worked closely with the Chinese government to do more to protect their natural environment after their population numbers reached a record low of less than 1,000 individuals, thanks to the poaching of them for their pretty pelts and deforestation causing the loss and fragmentation of their forest homes. Since the first Giant Panda reserve was established at the Wolong National Nature Reserve in 1980, China has cracked down on the trading of their skins and gradually expanded the protected forest areas to now cover 1,400 square kilometres. The current population is known to be spread across 20 pockets of bamboo forest, much of which is now protected by Chinese law which has been a major factor in helping the populations of Giant Pandas to grow since the 1980s. Giant Pandas have been the national animal of China for a very long time and are highly regarded by the Chinese people who see them as a symbol of peace. 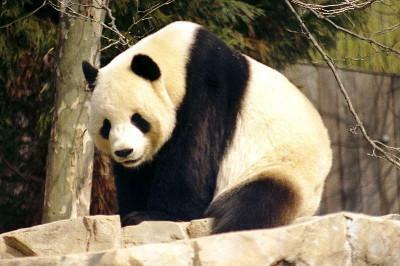 Despite the recent growth in their population numbers which has led to them now being listed as Vulnerable rather than Endangered, the Chinese government and international groups have come under criticism by some who question whether the vast amount of money and resources that have been put into protecting Giant Pandas in the wild and into breeding programmes, could have been better spent spread across helping other animal species facing extinction. No matter your opinion on this we can all agree that what has been done to pull this beautiful animal further from extinction in the wild is truly remarkable and really showcases the effectiveness of habitat conservation, reproduction schemes and clamping down on poaching to help to save a species. "This is a cause for celebration and proves that a united approach can bring a substantial difference to threatened species, even at a time of great economic growth in China." Glyn Davies, executive director of global programmes at WWF-UK.